A year or two ago, at my old home on the internet, and around the time a number of her novels were reissued, we had a lovely celebration of the literary legacy of Margaret Kennedy. And I could go on, but that was then and we need to talk about now. Originally it was my intention to celebrate Margaret Kennedy – and a number of other authors – on their birthdays, but when I started to look I found that the birthdays of the authors that I had in mind were clustered together in small periods of time. Margaret Kennedy’s birthday fell one day before the date shared by Anthony Trollope and Elizabeth Goudge; and I knew that Lory had a celebration planned for Elizabeth Goudge around that time and that April was quite busy with reading events. So that was out. When I was looking at her biography and wondering what to do another date caught my eye – the date when she was married. 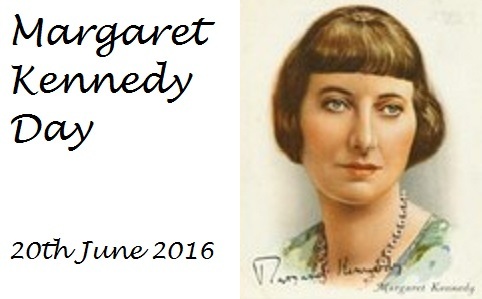 So this is your invitation to Margaret Kennedy Day on Monday 2oth June 2016. There’s no need to RSVP – though it would be lovely to know if you might come – all you need to do is to read a Margaret Kennedy book between now and then, and post about it on the day! I couldn’t find one definitive source, but I’ve pulled a list together from a number of sources and I think I have pretty much everything that was published in book form. All of the novels except the last one are in print; and most, but not all, of those titles are print-on-demand. None of the others are, but, because Margaret Kennedy was hugely successful in the 1920s – and well regarded after that – libraries may well have copes tucked away and there should be used copies out there to be found. The Fool of the Family (1930) sequel to The Constant Nymph. A Century of Revolution 1789-1920 (1922), history. Where Stands a Winged Sentry (1941), wartime memoir. The Mechanized Muse. P. E. N. series (1942), on the cinema. Jane Austen. Novelists Series No. 1 (1950), biography/literary criticism. The Outlaws on Parnassus. On the art of the novel (1958), literary criticism. A Long Week-End (1927), novella – published as a limited edition. Dewdrops (1928), novella – published as a limited edition. The Game and the Candle (1928), novella – published as a limited edition. Women at Work (1966), two novellas – The Little Green Man and Three-Timer. The Constant Nymph (1926), written with Basil Dean. Come with Me (1928), written with Basil Dean. Escape Me Never! (1934), a dramatisation of The Fool of the Family. Autumn (1937), written with Gregory Ratoff. And there is one biography – The Constant Novelist by Violet Powell. Her novels are quite diverse, so please don’t be put off of you don’t like the sound of one; there may well be another that you’ll love. And, just is case I haven’t convinced you, here is a lovely piece by her granddaughter, novelist Serena Macksey. I do hope that you will find a book and be part of Margaret Kennedy Day. Do tell me, and please ask is you have any questions at all. Lovely! I did love “The Feast” very much, and so I’ll try to join in with this in June! That would be great – Margaret Kennedy wrote a wonderful range of novels and so I’m sure you’ll be able to find one to enjoy. Yay! I read I think 3 or 4 of her works, thanks to you and this event. I think The Feast is my most favorite, but I loved all of them all. I am for sure joining the event…I just need to figure out what I am reading! Excellent – I had your name pencilled in and I’ll look forward to finding out what you read and what you have to say about it. I am putting this on the calendar! I still have The Feast to read, and I’m waiting for my copy of The Midas Touch. And then there’s the joy of rereading! I loved The Feast and I’m sure you will too. I couldn’t pick a favourite but it would definitely be a possibility if I did. I have a few books still to read, but when I’m done I’m planning to re-read in chronological order. Looking forward to this. I have Troy Chimneys to read. Excellent – I haven’t read the book but I have read many good things about it. Excellent. The book is odd and a little dated in places but the writing is wonderful, and of course it was the huge success that launched her career. So glad this is back! I’ll be in the midst of dissertation time, but if I can source one of her books, I’ll do my best to review it! I have my eye on the novellas, but am finding that they’re rather rare (and quite expensive!). I hope you can join in again – I’ve allowed a couple of months for people to find books, read and schedule something for the day – but of course I will understand if you can’t. And it’s lovely to see Margaret Kennedy posts on any day of the year! I very much appreciate that! The only books of hers which my library carries are those which I have already read, so I’m going to try and seek out something new! I’ve just managed to find a copy of ‘Lucy Carmichael’ for under £3, so am buying it before somebody else snaps it up! Now that is a very good find. I loved that book and I’ll be very interested to find out how you get on with it. So pleased to hear it! I had planned to read all of the blurbs for her books and then choose, but something about it just grabbed me. I can’t wait for it to get here! I will definitely be joining in! Thanks, Jane! Hooray! It wouldn’t have been the same without you. I’ll be joining in, though I don’t know what I’ll be reading yet. I’m tempted by Lucy Carmichael and Troy Chimneys. How very nice to have a Margaret Kennedy read! I just picked up a copy of The Feast. I’m not always good about reading books at exactly the right time but I very much enjoyed The Ladies of Lyndon, and will try to remember to remember Margaret Kennedy Day. I think that sometimes authors like Margaret Kennedy who are in print but unpromoted deserve a little celebration. I was very impressed by The Feast, I know others who thought as well of it, and I do hope that you’ll enjoy it too. The Feast is one of my very favorite books. I e ill read Lucy Carmichael and The Forgotten Smile. Mine too. 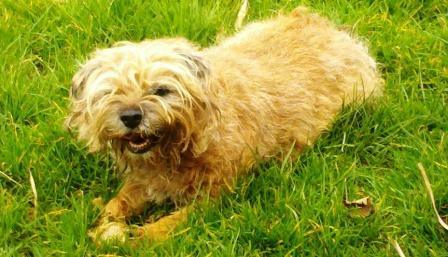 I love Lucy Carmichael too but I think The Feast is cleverer and more accomplished. I’ve fallen in love with Kennedy as a writer. I look forward to reading more of her books and to reviews posted by others during your Margaret Kennedy Day. P.S. I’m new to blogging and don’t know if I’m participating correctly in this event. I’ll welcome any pointers. What a lovely find, and how wise your mother was to save that book. I fell in love with Margaret Kennedy’s writing and though her work is a little variable I have found something to love in every book. At first I thought they were all quite different, but I’m seeing common threads running through many of her books. I hope you will find and enjoy them too.